So to start from the beginning, Thunder Force IV is a direct sequel to it’s predecessor Thunder Force III. Two years after the events of the latter game, survivors of the ORN Empire reformed to create a new threat called Vios. After a failed attempt to defeat this new threat, the Galaxy Federation decided to counteract this new threat using a new fighter craft called Fire LEO-04 “RYNEX”. 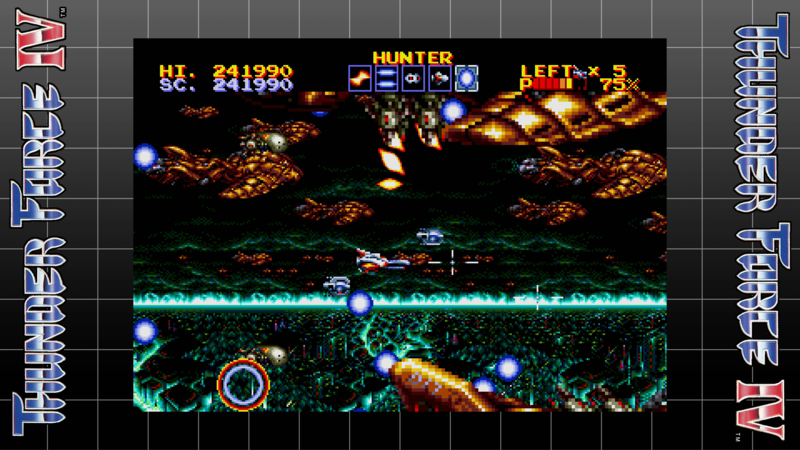 The player is tasked with controlling the RYNEX through ten levels, the first four able to be tackled in any order as desired, dodging projectiles and shooting down enemy threats. On the surface it’s a rather straightforward game in it’s genre, but what makes Thunder Force IV special is the execution. Thunder Force IV is a tried and true shmup where you are tasked with simply reaching the end of a stage, having to dodge enemies and projectiles while the screen scrolls. The main draw of the gameplay is the powerup system. By default you only have two weapons, Twin Shot and Back Shot, but by collecting more upgrades you can gain access to three other weapon types plus upgraded versions of Twin Shot and Back Shot called Blade and Rail Gun respectively. In addition, the player can collect orbiting pods called Claw that will provide additional fire and can snuff weak projectiles upon contact. You can toggle between each weapon with a button press, even while the game is paused. The player also has the option to control their movement speed, with 4 pre-sets to choose from. 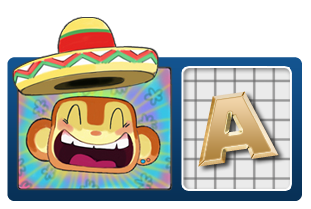 The weapons system adds a strategy element to the game, as each weapon has their own strengths and weaknesses. For example the Hunter weapon is weak but has homing abilities, making it useful for clearing away swarms of weaker enemies. Meanwhile the Snake drops bombs both above and below the RYNEX, making it useful for destroying enemies above or below the player. However all of these weapons pales in comparison to the Thunder Sword you obtain by the second half of the game. The Thunder Sword is a laser attack that requires the player to not shoot for a few seconds and have Claws on hand, but once released it creates a very powerful attack that can even obliterate bosses. Savvy players can absolutely destroy bosses and swarms of enemies using this weapon, so it’s encouraged to play wisely. While this is all good, the game of course counter balances this with it’s difficulty. Thunder Force IV like other games in the genre will punish clumsy players by stripping away a power-up for each death. The Blade and Rail Gun weapons will downgrade, the Snake, Free Way, and Hunter weapons will disappear, and any Claw the player has will be gone. It’s not as punishing as other games in the genre, but there will be situations where you will regret dying due to not having the ideal weapon anymore. Overall, this game is indeed difficult as the game is not afraid to throw out a lot of enemies or projectiles at you, while each boss is unique with their own specific attack patterns and weaknesses. Luckily for those that aren’t good at the game, SEGA AGES Thunder Force IV does provide a “Kids Mode”, which is effectively the same game but makes the game slightly easier by not stripping away a powerup per death and provides the player with a shield that can tank one hit. This is also a game I would recommend using the save state feature if you aren’t confident going in. But arguably the biggest strength of Thunder Force IV is the presentation. 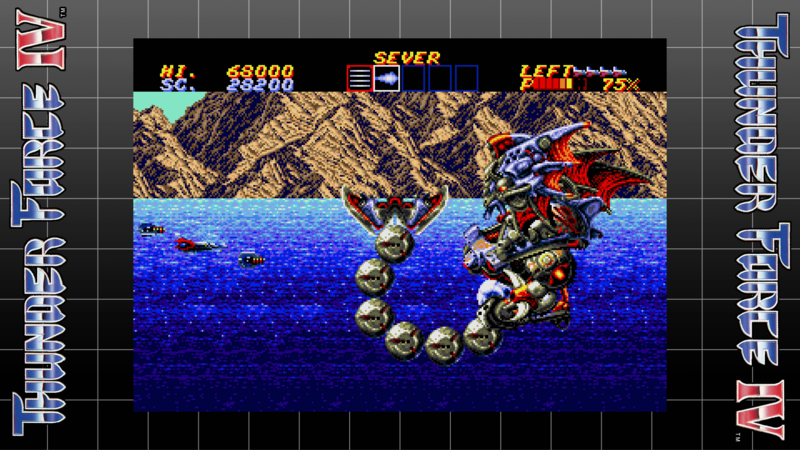 The game features a surprising amount of technological feats such as multiple parallax scrolling tiles in the background, distortion in the water, and rotating sprites such as the first stage’s boss with it’s tail. The best part is that all of the aforementioned details appear as soon as you start a new game and play through the stage Strite. The later levels don’t hold back either, such as having several large sprites flying through the screen. The only downside is that while it’s visually impressive, it has a notable flaw with lag. If too many enemies or projectiles are on the screen, the framerate will start to tank to roughly half the speed. While to some this may seem like a positive to help the player dodge enemies or projectiles better, the inconsistency is still rather glaring in an otherwise impressive looking title. Luckily with SEGA AGES Thunder Force IV, there is an option to remove most of the lag called “Reduce processing delay”. I say “most” since there’s one exception, the midboss of the Ruins level will still lag a lot even with this enabled. But from my experiences, this is the only case of the lag ever showing up with the reduce processing on. Another strength is the music. This is a perfect example of the potential of the SEGA Genesis’ sound capabilities. While the console’s Yamaha YM2612 sound chip is notorious for it’s limited sound capabilities, the developers at Technosoft exploited it’s quirks to create a soundtrack that mixes a faux-techno and metal. Right out of the gate the song “Lightning Strikes Again” pumps you up to play Thunder Force IV with it’s electric guitar-esque wailing, and every stage follows suit with their own unique theme. It has a healthy variety too, ranging from the first stage’s optimistic song “Fighting Back” to intense boss themes like “Stranger” and “Simmer Down”. The only weakpoint are the voice clips, which are somewhat low quality due to the limitations of the SEGA Genesis hardware. But once again, the developers at M2 has given the player two options regarding to the sound. Players can either have the music cut out when the voice clip plays, or have the music still play at the cost of the voice clip quality. But regardless, this issue is minor enough that it isn’t distracting. So, with that being said and done. Is this version of Thunder Force IV worth it? Yes, absolutely. The only alternative I could “maybe” recommend is Thunder Force: Gold Pack 2, since it packs similar features to the SEGA AGES version such as the easy mode and bonus STYX ship, plus Thunder Force AC as a bonus, but it’s very steep pricing on third-hand markets makes it not worth the investment. 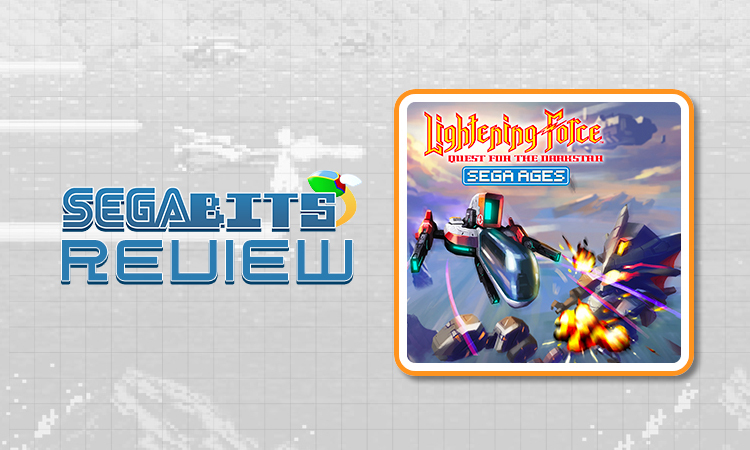 You can get the same features with SEGA AGES Thunder Force IV for a far cheaper pricing, making it the superior option. Even if ignoring that, it’s just simply an overall great game. Any flaws it inherently has can be addressed with the options, so there’s basically no risk to pick it up. That being said, it will likely still frustrate people who are not good at side scrolling shmups, so proceed with caution. I have downloaded this game on my Sega Genesis Ultimate Portable!